Storm was taken by Cotton at a particularly productive time in her career during the late 1930s. It blends pictorial and modernist influences as shown through the emboldened representation of the angular, denuded trees against the comparatively softly focussed clouds. The foreboding atmosphere of the storm is captured in the photograph through Cotton’s low-angle vantage. The three bare trees in the foreground function as the vectors, guiding the viewer to the ominous sky and subsequently down to the eerily lit horizon. Cotton recalls taking this shot saying that, ‘these stark dead trees seem[ed] to be leaning against the approaching storm and added to the threatening atmosphere’ 1. Storm is part of a collection of Cotton’s photographs including Sky submerged and Orchestration in light which employ dynamic tonal contrasts in order to portray the forcefulness of nature. Cotton grew up in the northern Sydney suburb of Hornsby, the eldest of five children. She was gifted a Kodak No 0 Brownie camera by an aunt at the age of eleven, igniting her life-long passion with photography. Cotton completed a Bachelor of Arts at the University of Sydney with majors in Mathematic and English 1934. She defied her father’s wishes upon graduating and pursued a career in photography joining her childhood friend, Max Dupain’s studio at 24 Bond St, Sydney. 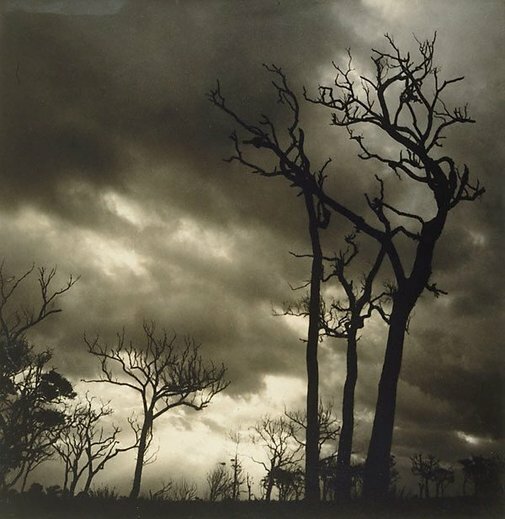 Cotton continued to practice photography, alongside working as a teacher, after relocating from Sydney to the rural NSW district of Cowra in 1946 2. Her work has been exhibited extensively during her lifetime and posthumously, notably at the London Salon of Photography in 1935 and 1937 and with major retrospectives at the National Library of Australia and the Art Gallery of NSW in 2000. Signed and dated l.r. sheet, ink "Olive Cotton '38".